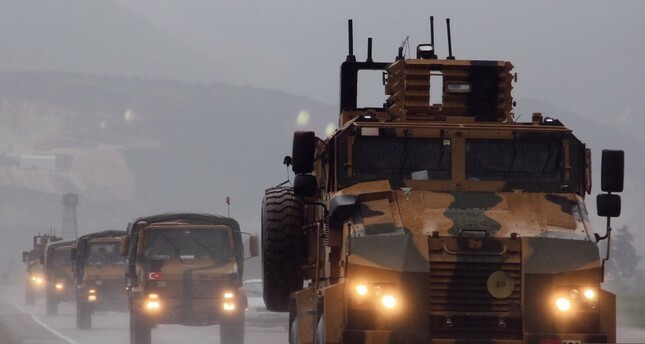 A convoy of Turkish Armed Forces military vehicles move to reinforce units on the Syrian border, March 31, 2019. Despite the fact that Turkey has repeatedly voiced concerns for its national security over the presence of the PKK-affiliated People's Protection Units (YPG) in Syria, the U.S. has shown no sign of a coherent stance and has attempted to justify its close partnership with the terrorist group in the name of its fight against Daesh. In the latest incident, U.S. Secretary of State Mike Pompeo on Wednesday claimed Turkish military action in Syria would have "devastating" results. According to the readout of the U.S. Department of State following a meeting with Foreign Minister Mevlüt Çavuşoğlu in Washington, "Pompeo expressed support for ongoing negotiations regarding northeast Syria while warning of the potentially devastating consequences of unilateral Turkish military action in the region." However, it was noted by Foreign Ministry spokesman Hami Aksoy that the readout published by the Department of State was obviously prepared before the meeting held between Çavuşoğlu and Pompeo and underlined that the readout contains matters that were not even raised during the meeting. "Similar issues were also encountered during past meetings. Our alliance naturally requires that such statements are prepared with greater care while avoiding including matters that were not raised during the meetings," Aksoy stressed. The remarks highlighted that the U.S. neglects Turkey's right to ensuring national security. Turkey has warned it could carry out another cross-border operation into Syria to rid the region east of the Euphrates of terrorists. Despite Ankara's objections, the U.S. has continued its support for the Syrian Democratic Forces (SDF), which is dominated by YPG terrorists. Turkey maintains that it has the right under international law to defend against threats to its national security, including the danger posed by a "terror corridor" in northern Syria. Çavuşoğlu, who was in the U.S. to attend the NATO Foreign Ministers' Meeting, also held various bilateral talks discussing regional issues. "We're working with Turkey to create a safe zone of some length along the Turkish border where there would be no YPG forces because Turkey feels very nervous about the YPG and their ties to the PKK," the U.S. Special Representative for Syria Engagement, James Jeffrey said last week. Turkey expects the U.S. to heed its legitimate national security concerns and take action befitting the spirit of alliance. In an article in The Washington Times on April 3, Çavuşoğlu said: "We must, however, also share the burden of risks by upholding the logic that what threatens one ally threatens the entire alliance, backed by genuine, sincere cooperation and solidarity among allies." Referring to some member states' missteps, Çavuşoğlu underscored that "supporting Turkey's enemies and resorting to economic and other leverage would poison the well for all allies." The foreign minister highlighted that the biggest challenge that NATO faces is unity and cohesion among allies, which can only be attained by being sensitive to each other's interests and perceptions. He underscored that NATO is and will continue to be central to Turkey's defense and security policy, as has been the case for the past 67 years.